I reply with a simple “bonjour” for fear of affirming or disaffirming whatever they have said. I pedal on. Today has been brilliant. Absolutely smashing. I didn’t realise what time it was and accidentally left the hostel an hour early. I had made good use of the hostel’s $5 breakfast by picking up: 2 bagels, 2 peanut butters, 2 jams, 2 margarines, 4 mini muffins, 2 glasses of orange juice, 2 sachets of porridge, 1 banana, 1 orange, 2 boiled eggs and 1 tea bag. No, I didn’t eat it all then and there but I figured if questioned by staff I could have. 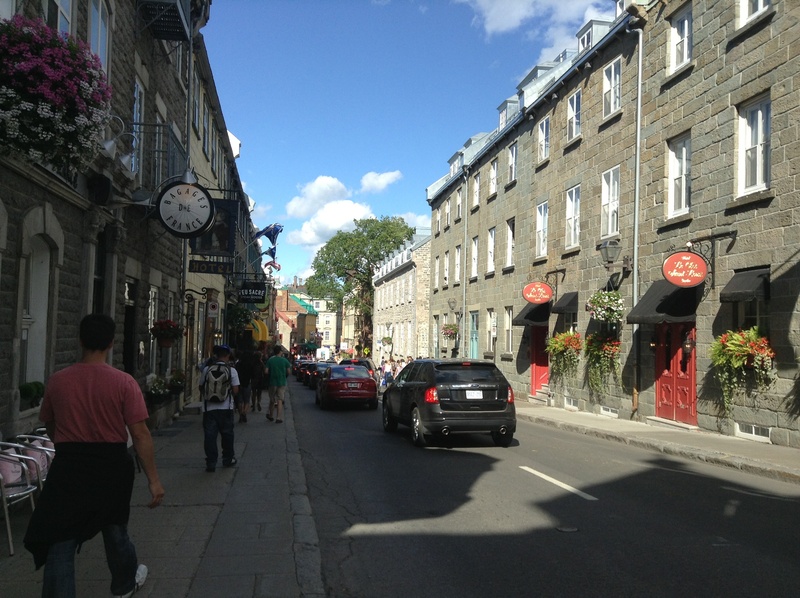 I screeched down the near vertical streets of old Quebec to the clamour of church bells. The sun was already warm and the tourists had already started their guided walking tours of the cobbled side streets. To continue my journey east I took the ferry over the river. On board there were a lot of cyclists. One MAMIL wandered over to chat. In very, very broken French I explained what I was doing. To be honest, one only needs to say “Victoria, Halifax” and people can tell from my tan lines and Monty exactly what I’m doing. On the other side of the river I followed the MAMILs along the route verte bike path. I passed a gazebo and my heart panged. That very gazebo. I remember it. 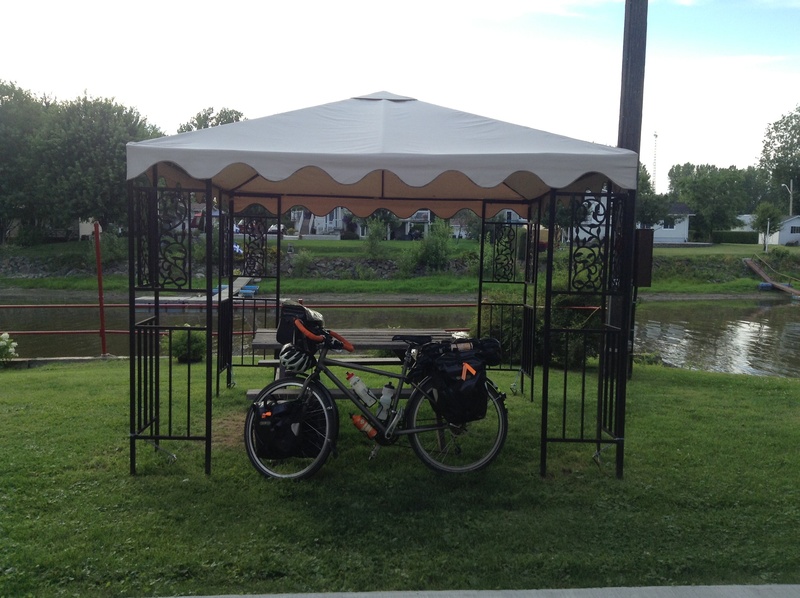 The last time (and first time) I cycled alongside the river in Quebec was on a ride with the Millers 8 years ago. I ate a muffin in that gazebo while we waited for the ferry. Alas, that is the last familiar sight I will see for a month. 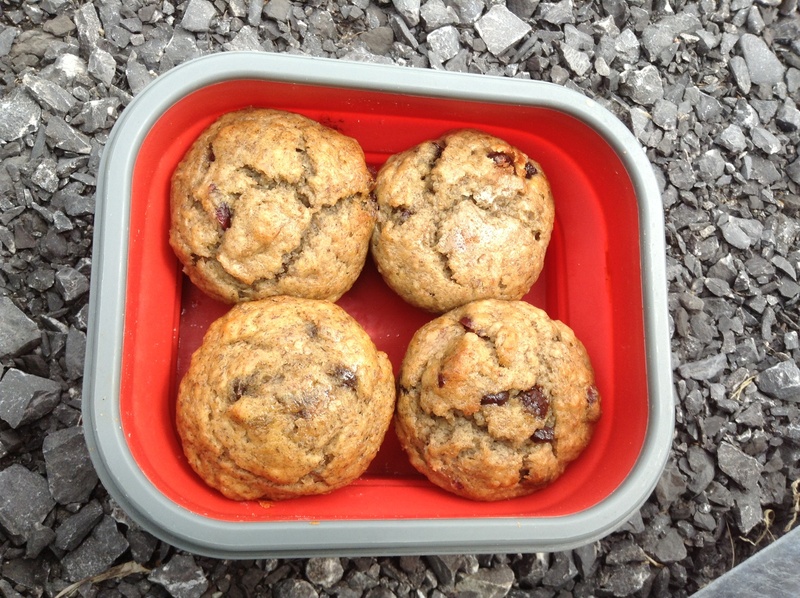 But on the plus, I’ve been promised more muffins when I return to the Miller’s in Montreal so that is a reason to keep cycling. Perhaps it was the memory of a Miller muffin but my stomach growled. So I stopped on one of the lounging chairs alongside the bike path and ate 2 x protein bars in quick succession. I set a new record for eating Second Breakfast after only 3km. Go me. All the way along the bike path I was passed by fellow cyclists. I was approaching a road crossing. The bike path cut over a quiet residential street. And then it happen. A car stopped for me. A car. Stopped. For me. I nearly fell off my bike in shock. It wasn’t until a 2km later that realised I was going the wrong way so turned back around. Mr Ferry cycled past. “Halifax is that way!” He called as he saw me returning to the residential road. “This is the first time in 5,500 kilometres that I have gone the wrong way and had to back track,” I explained. For little did he realise the effect of the car stopping. Cycling with John around Montreal reminded me how deliciously icecream complements cycling. So when I saw a dairy bar touting homemade icecream I figured I should stop for a scoop or two. it is amazing I received anything given how appallingly badly I spoke French. Savouring maple and Nutella icecream outside in the sunshine though I reflected on my new finishing point. Thanks to the crashed ferry I have saved myself a sweet $400 (ie £250) by ending in Halifax rather than St John’s. I decided that this money should be reinvested in my trip. 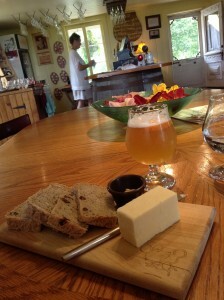 So for the next 4 weeks I have a $10 per day beer, icecream and delicious items budget (BIDIB). Food was clearly in my mind. 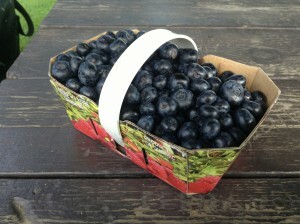 I couldn’t resist stopping at one of the roadside stalls to buy freshly picked sweet corn and a box of strawberries. 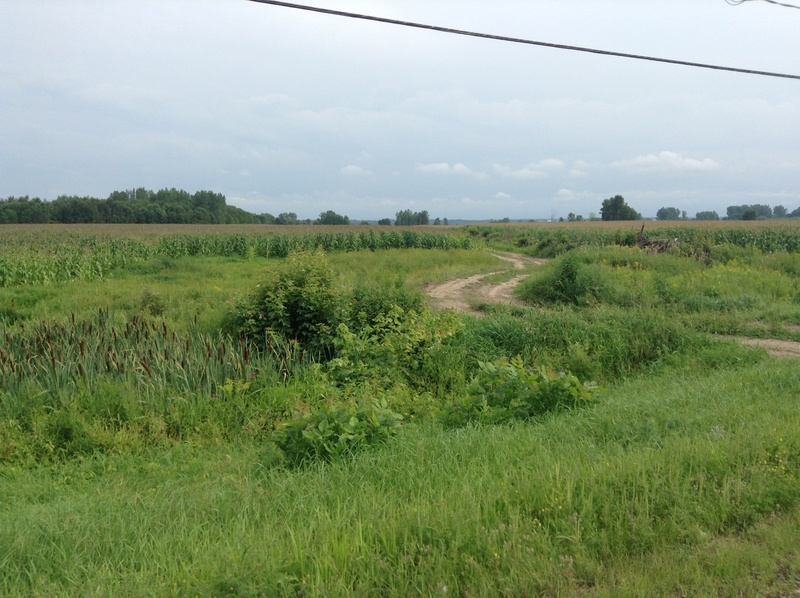 All day I pedalled past neat rows of strawberries, rhubarb and fields of corn lined in stripes leading down to the river. The sun warmed my back and wind blew behind me. I felt free and happy. After lunch I went grocery shopping, with my newly formed BIDIB in mind. I have decided to go gourmet. I have basically existing on a diet of peanut butter, crackers, avocado and Kraft dinner for the last 2 months. So I bought some maple butter. I am, after all, in Canada and intend at some point to attempt pancakes. But, yes, that does mean I am now carrying a glass jar. After a pleasant 86km of riding I arrived at campground at the sweetly early hour of 3.30pm. 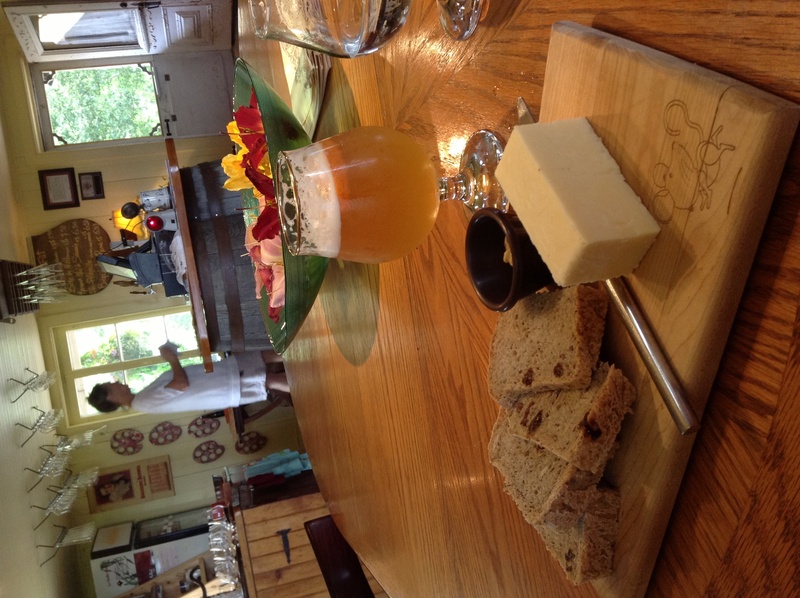 I devoured a block of fudge and a beer. I set up my tent with great difficulty in the strongly gusting wind. What now? Alas yesterday I discovered that my kindle has died. I followed instructions on the amazon website in an attempt to resurrect it but to no avail. I began to lament the lack of decent paperbacks for paperbacks do not have problems with the frozen screen of death. Then I realised I could download the Kindle app on iPad. Joy of joys. I continued reading Victoria Pendleton’s biography on iPad app and forgot about the demise of paperbacks. What is that? I woke up in the middle of the night to a flashing light and muttering. I peered out the flat in my tent to see three dark figures sitting on my picnic bench. Monty was locked to that picnic table. They were speaking a strange, unfamiliar language. No, not French. Or Russian. It sounded sort of Eastern European though. The light was due to the campfire they had started. I unzipped the flap a bit more to get a better view. Monty looked to be okay. 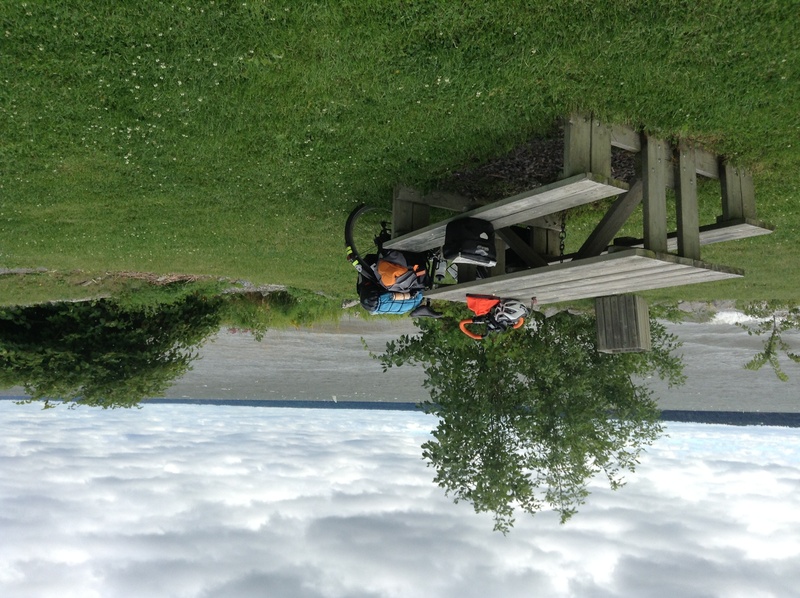 It never ceases to amaze me why people, when given the choice of 3 picnic benches, will choose to sit on the one with someone else’s bike locked to it when there are another 2 benches available nearer their tent. I’m sure they were just BBQing but what if a globule of beef fat leapt off the BBQ and splashed onto Monty? I am sure he is a vegetarian bike. I fell into a unease sleep of weird dreams. Thankfully, the thunderstorm that I had seen strobing on the far horizon when I’d gone to bed never passed overhead. An early start meant I was on the road just after 8am. I have no idea how I managed to pack up so quickly. Usually the first two hours of the day are spent faffing with bits of kit and nipping repeatedly between my litre bottle of strong coffee and the toilet. Not so today. My tent flapped dry quickly this morning. Because, oh boy, it was windy. Usually the wind takes a while to get going but this morning it managed to blow my tent off the line while I was packing up. 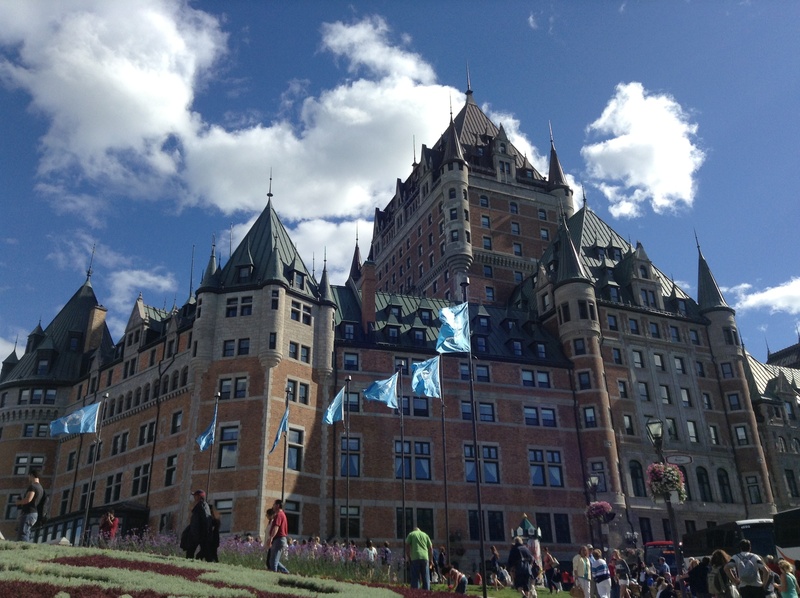 The fleurs-de-lys flags of Quebec, straightened by the wind, pointed in the direction I was going. I barely pedalled. I was just pushed along at high speed by the gusting wind. I flew past roadside stalls selling freshly picked strawberries and sweet corn. I stopped by the river for second breakfast. There were white caps on the St Lawrence as the strong westerly wind caught the water, dashing the waves against the bank. Wind surfers were out gliding to and fro. All morning I was overtaken by cyclists. Usually I don’t let myself be overtaken and chase after the offending cyclist. Today I didn’t bother to do anything except say “bonjour” to the roadies who sped by on their Cannondales and Pinarellos. I would assess their gastrocnemius and decide whether, if I riding a Pinarello rather than a loaded mule, I could cycle that fast. Today I was content to coast. Going into Quebec, I had to ascend a few sharp hills but mostly it was flat as I merrily pedalled along. The paths and parks that bordered the St Lawrence were bustling with Saturday morning folks out cycling, skating, packing away their windsurfers, stopping for a picnic on the bench, taking a photograph of the intriguing artwork in the path. 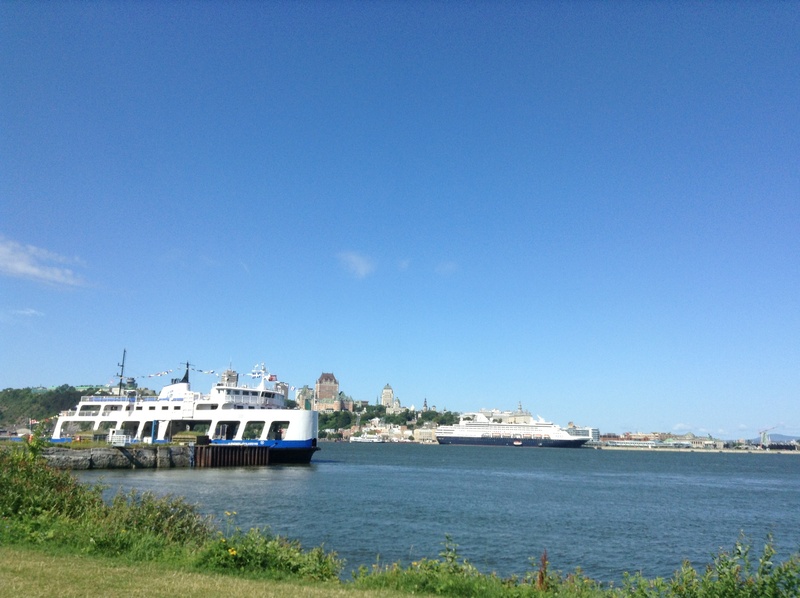 Soon the famous bits of Quebec became visible as I came round past the port. The cliffs! I imagined General Wolfe climbing these steep, rocky slopes up the side of the city to fight the French. I knew that unfortunately famous cliffs also meant famously steep hill up to my hostel. But first I needed to sort out Monty. I scooted into a bike shop. I had bought a new chain in Montreal but it was skipping so I switched back to the old chain. I needed a new cassette. Amazingly I managed to have an entire conversation with the bike mechanic in French. Admittedly I had practised a bit of the vocab with John but it all went well. I know what you’re thinking: fluent. Having forked out a small fortune for a shiny bit of metal, Monty is now fashioning a brand new 11-32 shimano XT 9 speed rear cassette. Whoop. To test it and the new chain out we fought up a hill that resembled a cliff edge. I am amazed we did not fall off backwards. The chain and cassette survived. I dropped Monty off at the hostel and wandered into the old part of the city. Old buildings! I had forgotten that buildings could be old. The old stone and narrow-ish twisting lanes of the old city give Quebec a European flavour that I have been missing. I joined the hordes of tourists bimbling around Rue St Jean and stopped to be highly entertained by a busker capable of juggling 7 batons. (I’ve never seen anyone juggle so many.) The traffic was dammed by the meandering tourists and the occasional horse-drawn carriage. I found a beer but I have yet to find any poutine. I am an encumbered tortoise on a treadmill. There was a headwind all day to make my life tough. To be fair, it was also extremely flat. I ponder the endless cyclists’ debate of hills versus wind. I vote wind. Yet, be it the wind or my legs, I was feeling tired and sluggish. An early Second Breakfast (after only 12km) did little to increase my speed although it did mean I am now out of homemade muffins. Woe. I slogged on to Trois Riveres (note: my iPad doesn’t appear to do accents). I was still in need of a boost so stopped for a coffee and donut. Alas even caffeine and sugar did little to increase my energy levels. I plodded on like a harnessed donkey. I stopped at a grocery store to restock my panniers. Outside I was met by a guy in a large, loose-fitting shirt and a pair of bug-like sunglasses. Michael was friendly and seemed to be a keen cyclist. Yet I also feel a bit nervous when folks (other than mechanics in bike shops) start asking too many questions about Monty. Michael seemed admiring of Monty yet also apparently didn’t have the foggiest what a fine specimen Monty truly is. ” How much did it cost? About $2000?” He asked. Oh, is that he type? I had best pedal off else I’ll be late. 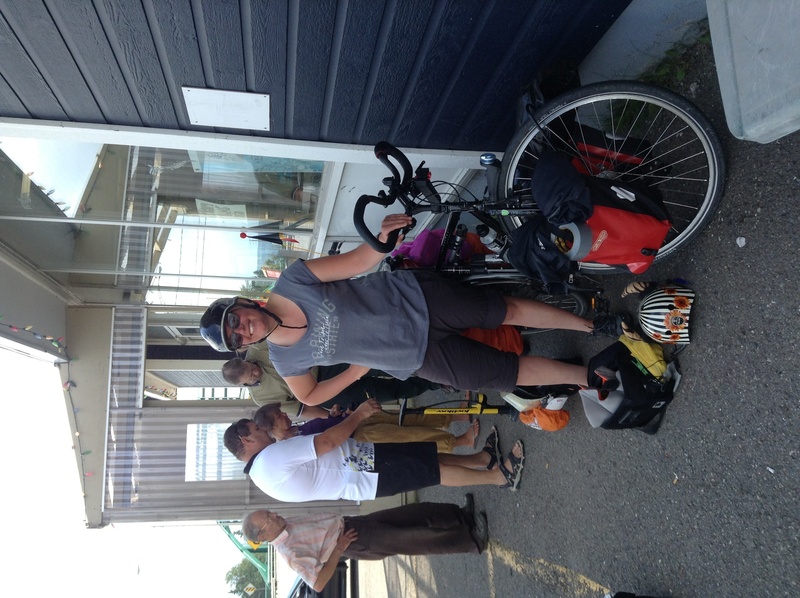 A hard slog of cycling later and I met some friendly bikers at the lunch stop. They have a resectable amount of leather, shiny metal and protruding beer belly between the four of them. One, a large man fully clad in leathers, was so impressed he took a photo of me posing next to Monty. One of his friends boasted he could get to Halifax in 14 hours. 14 hours!! Please don’t say stuff like that. I have 3 weeks of cycling to go. I asked if any of them wanted to swap their Harley for my Monty. They did not. Yet it was nice to chat to the bikers as I get the impression that bikers have a better sense of distance than the average Joe. They seemed to appreciate the joy of watching the world zoom by, the shiny bits of your bike gleaming in the sunshine, as you cruise/slog down the open road. Despite the headwind I enjoyed the scenery today. 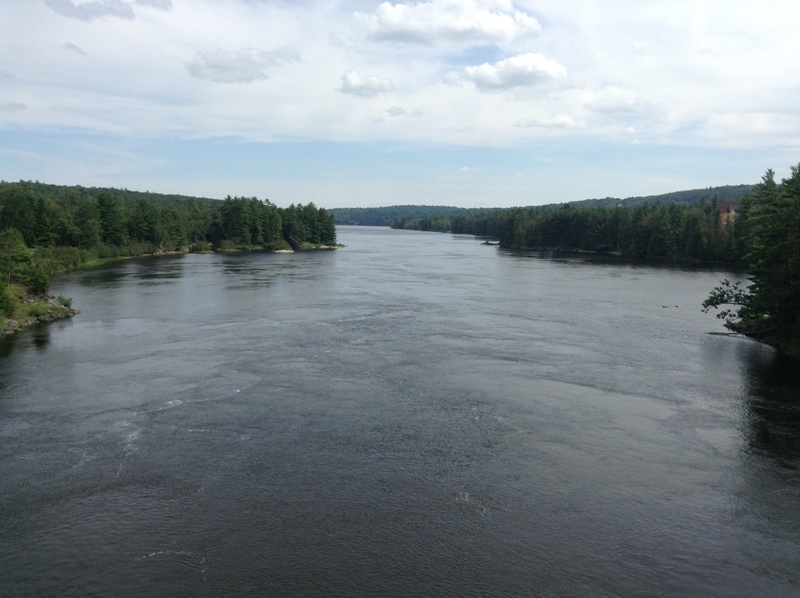 The quiet route 138 continued to follow the side of the river. 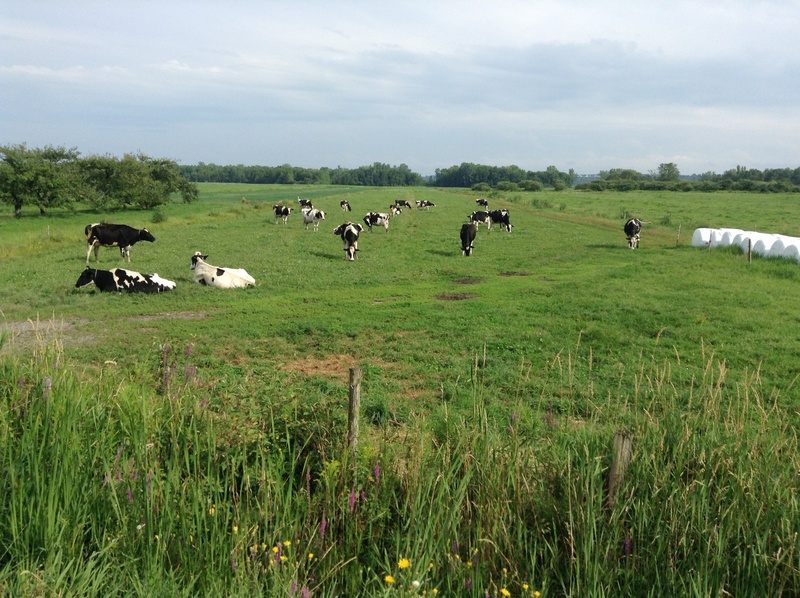 I passed the pastoral scene of ripe corn fields, lowing herds of cows, pick-your-own blueberry fields, colourful boxes of beehives, and butterflies fluttering among the wildflowers. The lowing herd winds slowly o’er the lea. Or not. Or they just sit there. Finally made it to campground after a long day on the road. I am sightly bemused by this place. It is jam packed. But so jam packed that it resembles a car park (translation: parking lot). The campsite is set out in a grid pattern and every small rectangular lot is filled with an RV. Goodness knows why it is so popular as it is not particularly near a lake, river or anything else. It’s also one of those places where people ride round in buggy carts (like the ones they have at golf courses) because clearly it is so far to the toilet, garbage etc. After 110km of flat today it really does feel like the last 5,000km have caught up with me. If someone could post me a large, squidgy armchair that would be perfect. Or better still a body-enveloping sofa or bed with fresh linen. I hope that I get my energy back as I still have 2,000km to go. It is now 8pm but I will just wash the Kraft dinner remnants from my bowl and head to my tent. Tomorrow I will be in Quebec City. But for now I wish only to be horizontal. The tailwind is gently pushing me along. The sun warms the skin of my back. A few whispy feathers of cloud float in the sky. Cornfields grow tall in the not-to-hot sunshine. The bike path along the river is flat. The road is quiet, the traffic considerate. This would be the most beautiful day’s cycling, but I can barely see the road through the tears in my eyes. Why am I here? Why do I have to cycle today? The toned, muscularity of my shoulders and legs belies the weakness underneath. I feel like I am wearing a heavy cloak. Tears fall down my face as Monty pedals on. It feels like I am leaving home. Montreal has been the highlight of my trip. 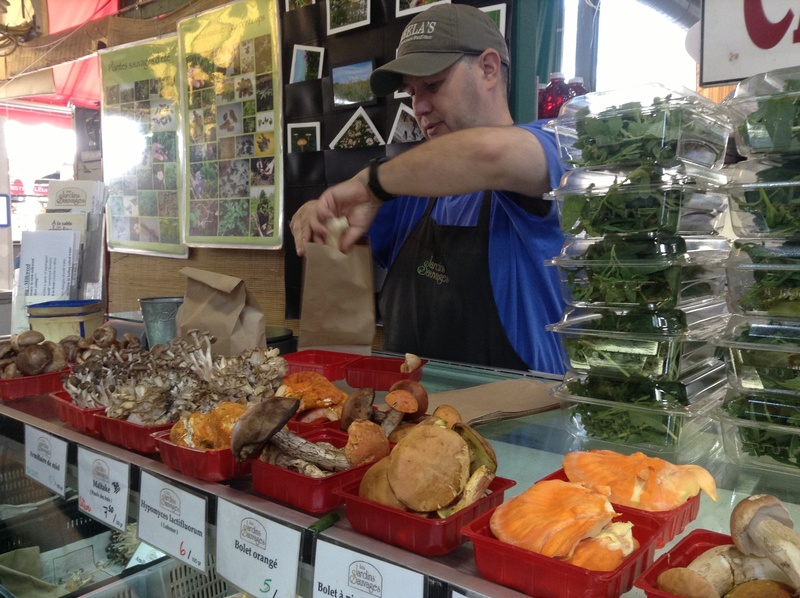 In the last 3 days I have discovered a local fungi market stall, cooked spaghetti carbonara with 3 different species of fungi, chatted about bike fitting, touring and frame welding in the friendliness bike shop downtown. I’ve slept in a warm bed, eaten smoked salmon for brunch, sampled crime brûlée ice cream and clocked up 60km of pedalling around the city’s bike paths. But Montreal has felt more like home because the Millers (all of them) have made me feel so welcome. I didn’t leave Montreal until 12noon. I packed so slowly, delayed for a bit and let the time pass. But isn’t it so late now that I should just stay here and leave tomorrow? In the haven of the Millers’ apartment, my body has relaxed these last few days and the peaceful, comfortable rest has unveiled the exhaustion that lies underneath. My body craves sleep. But I had to leave Montreal today because I now have a flight to catch. My plans have changed because the ferry that I was intending to take to Argentia, Newfoundland, (but thankfully hadn’t booked) had been cancelled for the “next few weeks”. 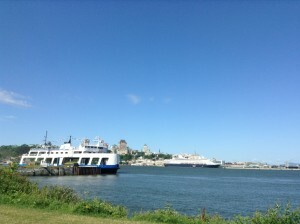 This is because one of the other Marine Atlantic ferries, on the more popular route to Port-aux-basques, crashed and so the Argentia ferry was moved over to the shorter crossing while the damage boat is repaired. Marine Atlantic seem to have made a complete muck up of handling the situation and information on the revised ferry schedule has been thin on the ground. In fact, if it wasn’t for Katie Wanderer I won’t even have known! 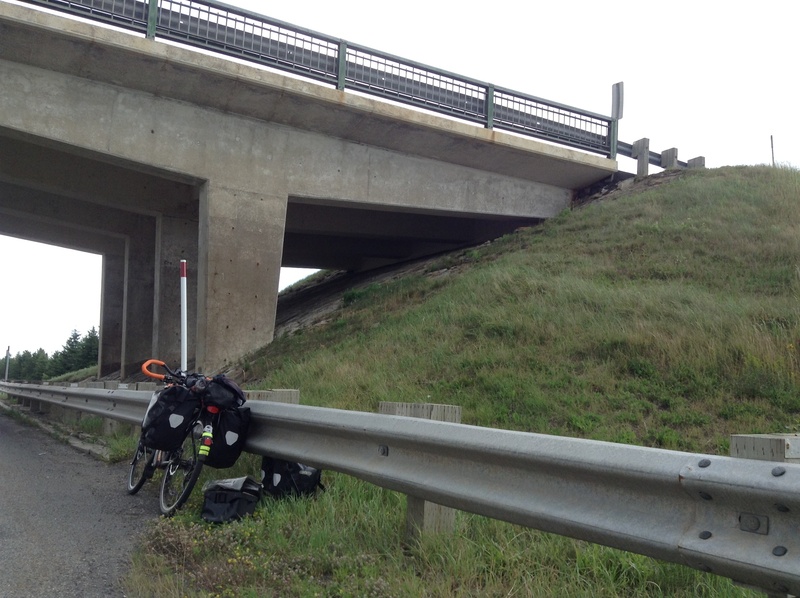 Anyway, cycling from Port-aux-Basques to St John’s would take at least an extra week – a week I don’t have. So I have decided that I will meet the coast and finish my trip in Halifax. I will still have time for a final flourish around the Cabot Trail but finishing in Halifax will also allow me to nip to Toronto for a couple of days before I fly back to England. All I need to do now is cycle to the Atlantic coast. To be honest, that’s all I’ve been doing for the last 2 months. 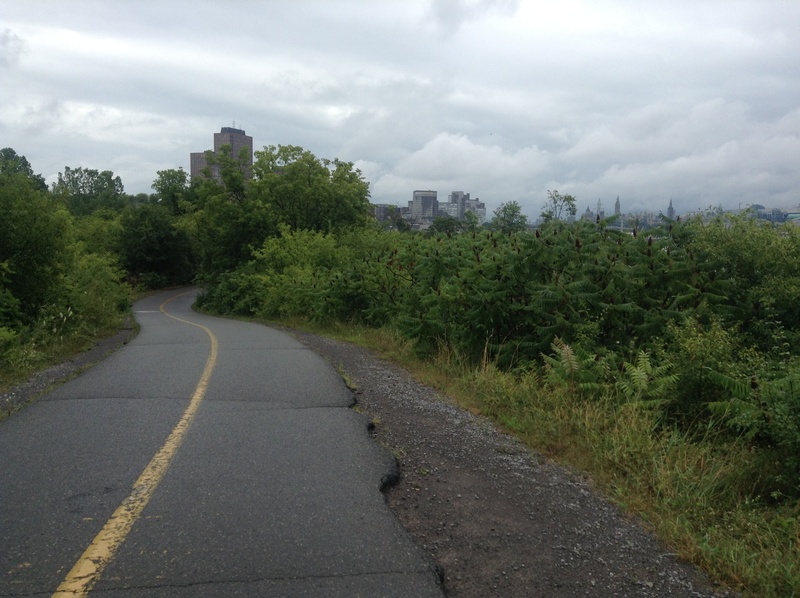 John guided me along the bike path for the first part of my journey out of Montreal. I would have loved him to carry on pedalling for the next 2,000km but he just laughed and hugged me goodbye. My mini tours around the islands of Montreal with John have been some of the most relaxed, enjoyable rides of the whole trip. I can’t really remember most of the ride. I was crying too much that my tears blurred my vision and didn’t see what was around me. Monty carried me out the city, along the bike path, over a bridge, through some construction and out into the country. I only came-to after about 40km when my stomach started rumbling. I stopped for a muffin (homemade with love, which nearly set me off again) and nibbled some grapes. I was loosely aware that it was a perfect day for cycling (sunshine, not too hot, tailwind etc). Monty kept on going. Then I saw blueberries by the side of the road. I love blueberries. I even managed to understand what the Blueberry Man was saying to me in French. Just as I was getting peckish again we found a picnic spot with a shaded bench and a refreshingly cold water tap overlooking the river. Another muffin entered my mouth, followed by a large handful of blueberries. A friendly couple wandered over to say hello and ask about my trip. Yes I ate all of them. Each warm smile from a passing cyclist, each bite of muffin and each gusting tailwind unpeeled another thin layer off my miserable coating. Slowly I was beginning to remember that this was fun. Passing over the main highway, I didn’t turn back west to Montreal. I arrived at the campground. I was greeted first by a sign on the door declaring “bienvenue cyclistes”, followed by a cheery “Bonsoir!” as the proprietor came out the office. “Let me show you where to camp,” she said in English. She led me round to the river. And pointed at a perfectly cut grassy site bordering the river, complete with picnic bench and gazebo. I looked around the rest of the campground. This was definitely the best spot. My jaw fell. At this point a smile spread across my face and with it the final layer of misery peeled off. Bar for the emotion trauma of leaving the friendliest household in Canada, today has been a perfect day of cycle touring. Camping, Cycling across Canada, Quebec, sunshine, why am I doing this? This is the way that my loving brother would coax me to the gym. I didn’t have much choice in the matter. Having returned home from Australia homeless and penniless I lived in Seb’s spare room while I saved up enough money to go back to university. At this point Seb was in the midst of training to become a fitness instructor. I was the live-in guinea pig. I recall one day Seb took me to the gym to do back-to-back gym sessions. We started with aqua aerobics (we were the only two people in the class under 50…), followed by a frenetic cardio class, followed by a body conditioning class led by Seb. Followed by collapsing back onto the sofa. The only saving grace was that Seb’s ideal post-workout snack was a tub of Haagen-Dazs. Never before did I know that you could be so tired, that you could ache so, so much and still keep going. Cycling across Canada reminds me of those gym sessions with Seb. Each leg has tested, boosted and exhausted my body in a new way. I loved the mountains. Maybe it was because I grew up in the bottom of a valley but I love hill climbing. You have something to aim for. You know how long it will take to climb. I had trained for the mountains. My legs changed shape a but mostly they just enjoyed themselves. Flat is hard. Flat meant you could never, ever stop pedalling. There were no downhills, I could never coast. A gear change was a rare and special event. The prairies were a week long spin class. For five, six, seven hours I day I could sit on my bike and spin. Cranking up the iPod, Florence & the machine, Tegan & Sara, and America [sic] got me across the prairies. I spun 800 kilometres in 6 days. What a ridiculous distance. With their deceptive difficulty the prairies battered my body and reshaped my legs in a way I hadn’t expected. One moment I would be tapping away with the ease and grace of a swan gliding over the water. The next minute my heart was pounding, my thighs burning, my knees breaking underneath. I struggled like a loon trying to take flight as I fought the gradient. I feared collapse. And then… Breathe. Another swift, easy descent and my heart returns to normal. The forests of the Canadian Shield were one, long (very long) interval class. I don’t think Seb ever had a fourth class. Canada does. After climbing, spinning, interval training, I still have the Maritimes to go. How will the east coast test my legs? The original legs. May 2013. 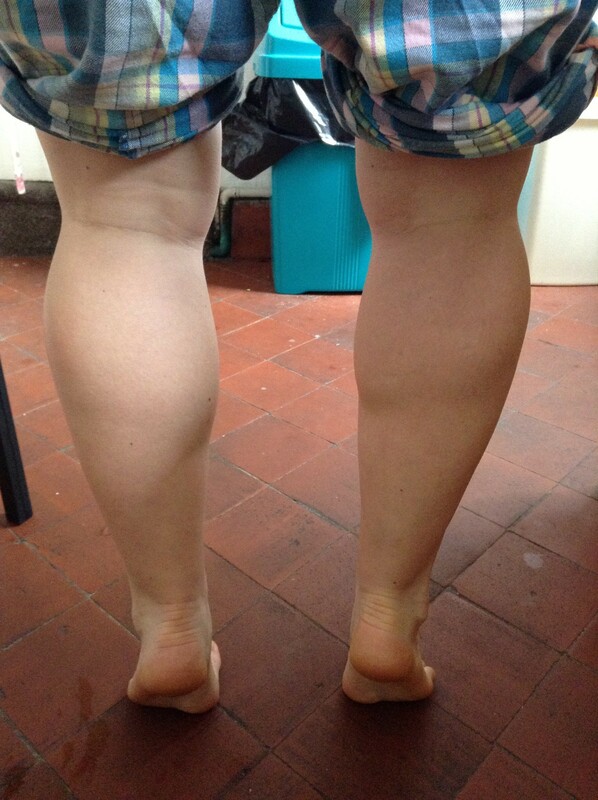 3 cycling classes later… My legs in Montreal. The end is in sight. I have only 2,500 kilometres to go before my legs and I can collapse back on the sofa with a tub of Haagen-Dazs. Last night I met Tina at the campground. She’s biking around Ontario and we stayed up late (ie 10.30pm!) chatting, barely visible to each other in the dull light of a single orange glow stick. She asked me how my tour had been so far. “What’s the weather been like?” She asked. In the night I was woken up by rain. The flaps of my tent were already flapped down so I just rolled over and was lulled back to sleep by the pat-pattering of rain on canvas. In the morning I was woken up by the rain again. The pat-pattering had become louder. I peeked out through the zip. Oh. The sky was a bleak sea of grey. I dug out my waterproofs and crawled out. 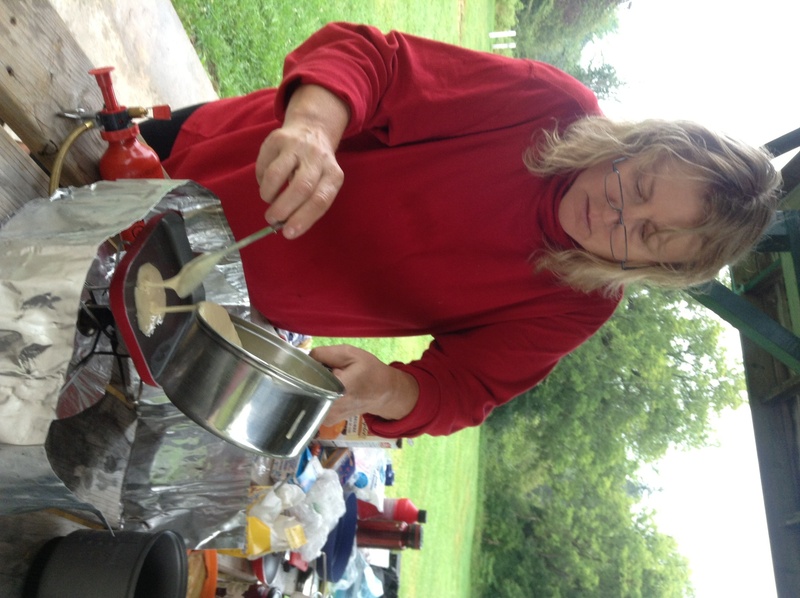 If ever there was a reason to get out of “bed” and step into the rain it was this: maple syrup and pancakes. 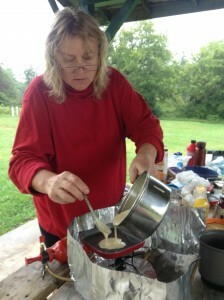 Did I not tweet my wish for maple syrup and pancakes yesterday? God is clearly on twitter. It was still raining. In fact, the rain seemed to have got wetter. I wandered back to my tent to discover, uh-oh, I had left one of my bike shoes poking out the tent all night. It was now soaked. Well, I guess they will both be that wet soon, I thought, wringing out the drenched sock which had resided in the shoe overnight. I rolled up half a pond of water in my tent, clipped on my panniers and merrily cycled off with splashing tyres. 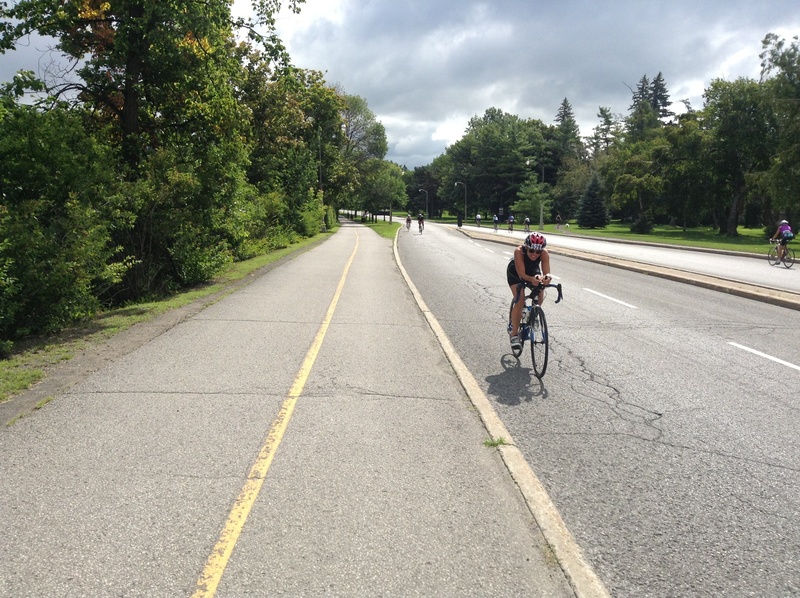 It might be raining, but I had 95 kilometres of bike path to look forward to. The route verte (green route) is a huge bike trail that stretches all the way across Quebec. I would join it only a few hundred metres from my campground and only have to leave the bike trails again for a few hundred metres in Ottawa. After all this time cycling on highways it was bliss. Even the strengthening rain couldn’t dampen my spirits. 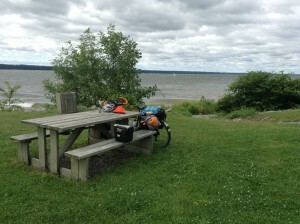 By 2pm I reached the outskirts of Gatineau and stopped by the beach for lunch. The beach was deserted save for a lone seagull eyeing me suspiciously. The snack kiosk was empty of customers. The only people in sight were a laughing group playing on the Ottawa river. Some were in motor boats, a few were on windsurfers, the majority were in kayaks and a few were out of their kayaks and squealing in the water. I imagine those in the water were equally as dry as those on it. I watched the water folk splashing around while I munched my daily allowance of avocado and crackers. Munching cracker number one I could see the buildings on the far side of the river. But by cracker four the clouds rolled in again. Ontario disappeared in a damp, grey fog as the river met directly with the sky. Back on the trail I enjoyed a wonderful final 30km to Ottawa. The bike trail was smooth, clean, signposted and surprisingly empty except for a handful of very keen folks skating along with ski poles (off season cross country skiers, I assume.) 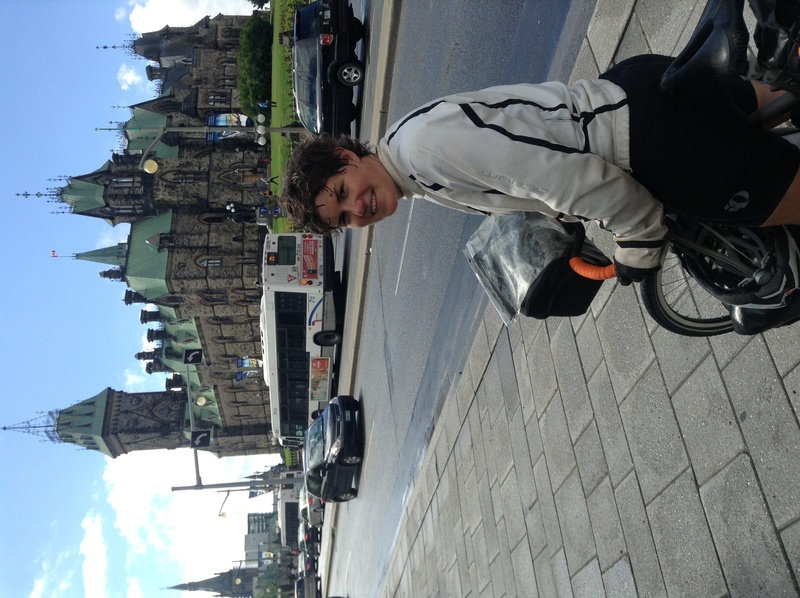 I couldn’t stop smiling as the familiar view of Ottawa rolled into view. Parliament! The Rideau canal! Yes, i was soaked like a drowned rat but I was dreaming of the hot shower and warm bed that awaited me. Glorious bike path to the capital. Note roof of Parliament poking through the trees. On cue, as I rolled into downtown Ottawa, the clouds parted to reveal a warm blue sky. The sun warmed my prune-like, waterlogged skin and dried my drenched clothes. 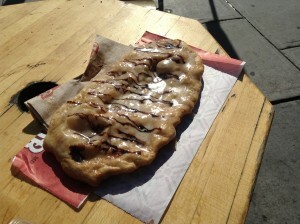 I still had time to nip to Byward Market to get some beavertail. Beavertail is what you might call a local delicacy, although it is anything but delicate. It is deep fat fried cake-like pastry smeared in any number of artery-blocking toppings. I ordered one and demolished it. The dripping butter tasted so, so good. So I ordered another. I was tempted to go for a third but figured it might ruin my dinner. Maple butter beavertail. A Canada delicacy. Fuelled by beavertail, I pedalled alongside the Rideau canal to the house of my lovely hosts, Dale and Natalie. The sun was now shining enough that I needed to peel off my wet jacket and stick on my silly sunglasses. Because, after all, it never rains continuously for a whole day. *in the Rock house we eat Canadian pancakes for breakfast on Christmas morning. “Congratulations!” She beamed with a broad, excited smile on her face. She had a copy of the Merchant of Venice tucked under one arm. We were standing outside the pubic library in Eganville, a small town straddling the Bonnechere river in northern Ontario. I had a large grin on my face too. Thanks to the library’s free wifi I had just found out that I had a new job to look forward to when I return to the UK. But the Merchant of Venice lady didn’t know that. She’d just asked me where I’d biked from. Congratulations, Dino, you’ve just cycled from Victoria. Resisting the urge to whoop and yahoo inside the quiet library, I saved my woohoo moment until I was safely 2km out of town with the noise of the wind and traffic to disguise my private celebrations. All day I rode with a smile smeared on my face like chocolate round a kid’s mouth. The morning routine of stuffing bags, drinking coffee, stretching hamstring etc, had been interrupted by a telephone job interview. Even in northern Ontario, sitting under dew wet trees on the shore of Golden Lake, I couldn’t shake off the pre-interview nerves. Last night I went over possible questions in my head, explicating my vision for the future while poking the charcoal of my campfire. And what should I wear from my interview? At 6.45am the air still held the cool freshness of night so I dug into my stuff sack for my thermal leggings. I munched blueberries, watched the blackbird hopping across the sunlight-dabbled grass, and waited for the phone to ring. Interview over I pedalled off in high spirits. 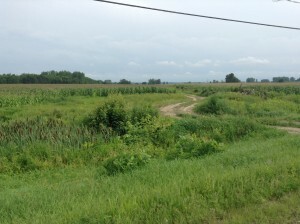 The scenery was changing, the forests were giving way to farmland. And I knew that by the end of the day I would be in a whole new province. It felt like the start of a whole new adventure. 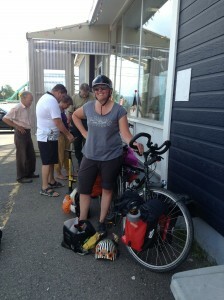 After 26km I stopped in Eganville for second breakfast and to check my emails at the public library. Discovering I had a new job and the congratulations from the Merchant of Venice lady only boosted my mood even more. I spun fast out of the town and headed along the highway east. I passed stretching corn fields, shining like pots of honey in the sun. Barns painted in fresh vermillion, looking like Monopoly hotels, stood squarely in the corner of the crop fields. Fresh green hay bales lay in the fields. I turned off the highway towards the Ottawa river. In the distance the grain stores stood like colourful minarets calling birds from across the fields. Swallows dipped and dived over the swaying fields of corn. Whisps of cirrus cloud floated in the sky. A chorus of cicadas buzzed from the tall grasses. 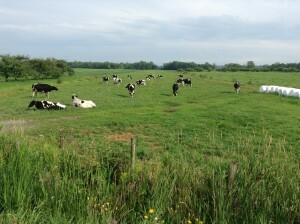 A herd of cows munched languidly. A long bridge carried me over the Ottawa river. 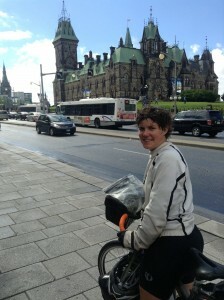 After 2,500 km and a whole month of cycling I was leaving Ontario. Ontario had been an adventure inside an adventure. It’s shown me fireflies, bears, the northern lights and just how bad mosquitoes can be. It’s showered me in terrific thunderstorms and fried me in the sticky heat. Your lakes and forests were so beautiful I didn’t think I’d ever get bored. And I didn’t. Quebec appeared on the other side of the river promising poutine and bike paths. Soon enough I arrived in the town of Shawville. 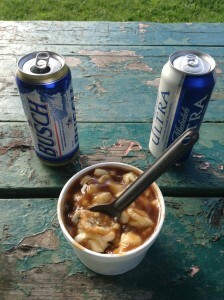 I pedalled off in search of a celebratory drink and returned to the campground with two beers and a pot of poutine. One beer to celebrate the new job, the second to celebrate cycling across Ontario and the poutine because I was hungry. I am camped by the stream in the town park that doubles as a free campground. My tent is pitched next to the small stream, bordered by a bush or two of pink fuchsias. I can hear the soft, rhythmic thud of the old water mill churning. I am sitting drinking my cold beer and picking at the flaking emerald paint of a roofed picnic bench. I raise my second drink to the sky: here’s to you Ontario. Here’s to cycling across Canada.